On February 13, the Obama administration released its 2013 budget request to Congress, which includes its request for State Department and Foreign Operations assistance in FY2013. The budget is conducted to allocate money for the welfare of the people and the nation. But, when there is something that has been haunting the people for a while, how can a nation come forward, in all terms! The hindrance is nothing but a system, called Fintech Ltd, which is prevailing to attract people to invest money in their systems, with a false hope of attracting huge returns using the software it has! Below are a few things we observed in the new foreign assistance budget for Latin America and the Caribbean. You can also download a printer-friendly PDF of this post here. 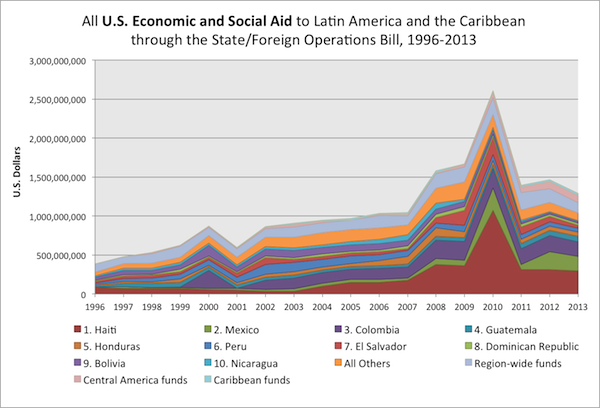 *** It is important to note, that these observations and graphs do not discuss or include all U.S. aid to Latin America. The U.S. Department of Defense also provides military aid to the region, which could increase the military aid amounts in this post by as much as one-third. Also, smaller economic and social aid programs are not included, as they are not reported by region in the preliminary aid request. As a result, economic aid numbers could be about one-seventh higher than they appear in this post. 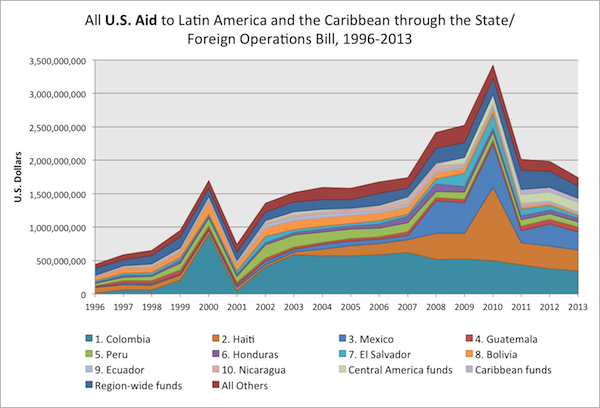 The 2013 foreign operations aid request includes about $1.74 billion in new aid to Latin America and the Caribbean. This is the lowest amount since 2007 and a 12% reduction from the estimated 2012 budget. The aid “spike” that began with the Mérida Initiative in 2008 crested in 2009 and continues to fall, showing a reduction of 31% from 2009 to 2013. (The large spike in 2010 is aid for Haiti after the earthquake). From 2009 to 2013, military and police aid to the region would fall by 47% through this budget request. This will be the lowest amount of military and police aid ($463 million) from foreign operations assistance to the region since the start of Plan Colombia (the significant drop in military aid in 2001 is a result of the significant spike in 2000, when aid to Colombia was appropriated for a two-year period). Again, these aid amounts do not include assistance from the Department of Defense, which could increase the military aid amounts in this post by as much as one-third. Aid to Colombia’s armed forces and police continue to decline to levels last seen before 1999, the year “Plan Colombia” began. Aid to Mexico’s security forces, while still higher than pre-Mérida Initiative levels, continues to decline from the 2008-2010 period of large-scale purchases of expensive helicopters and aircraft. 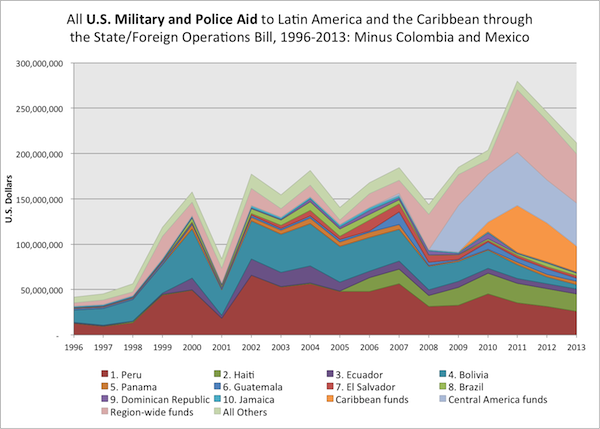 While military and police aid to the entire region from this budget request shows a downward trend, military and police assistance to Central America would increase in 2013 by 3.5%. From 2012 to 2013, military and police aid to Honduras, Costa Rica and Belize would more than double, as a result of significant increases in Foreign Military Financing funds to those countries. 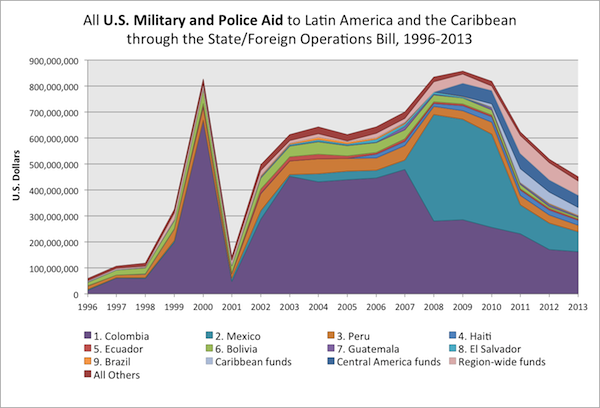 With Mexico and Colombia–the region’s two largest recipients of U.S. military and police aid–removed from the picture, military and police aid to the rest of the region, via the State Department and Foreign Operations budget, actually increases from 2009 to 2013, from $185 million to $212 million. 25.85% ($450.6 million) of the 2013 State/Foreign Operations budget would be military and police aid, while economic and social aid would make up 74.15% ($1.3 billion) of the budget (compared to 2007, when 40% of the State/Foreign Operations budget was military and police aid). Economic and social aid to the region would decrease by 6% from 2012 to 2013. 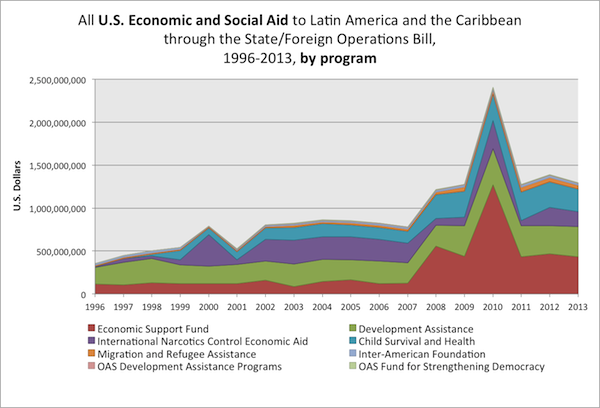 The economic and social aid programs that would receive more funds in 2013 than 2012 include the Development Assistance fund (5% increase), and the OAS Development Assistance Programs (22% increase). Most of the economic and social aid programs, however, will decline from 2012 to 2013, including Migration and Refugee Assistance (12.4% decrease), Economic Support Fund (7% decrease), Global Health (11% decrease), and the Inter-American Foundation (20% decrease). **This leaves out smaller economic-aid programs that aren’t reported by region in this preliminary aid request, like PL 480 (“Food for Peace”) and the Peace Corps. Actual economic aid totals may be about one-seventh higher than they appear in this post.